What Different Species Live in the Polar Region? Polar regions sit on the top and bottom of our planet. The Arctic Circle lies in the northern section, comprising sections of Europe, Scandinavia, Russia and Canada and all areas farther north. The Antarctic polar region is at the South Pole and is protected from commercial exploitation by the 1961 Antarctic Treaty. This means the animals living in the southern polar region don't have to worry about human interference as much as those in the Arctic, where people mine for oil and minerals as well as fish and hunt, disturbing the ecosystem for the animals who live there. Arctic owls, also called snowy owls, are well equipped to handle the frigid temperatures. Their thick layers of white feathers help camouflage them while keeping them warm. They sometimes follow their main food source, lemmings, to the southern edge of the polar region in the coldest part of winter. In the Antarctic region, penguins are the bird of choice. They swim instead of fly, but they use their wings to help them "fly" through the water and are skilled at hunting fish. 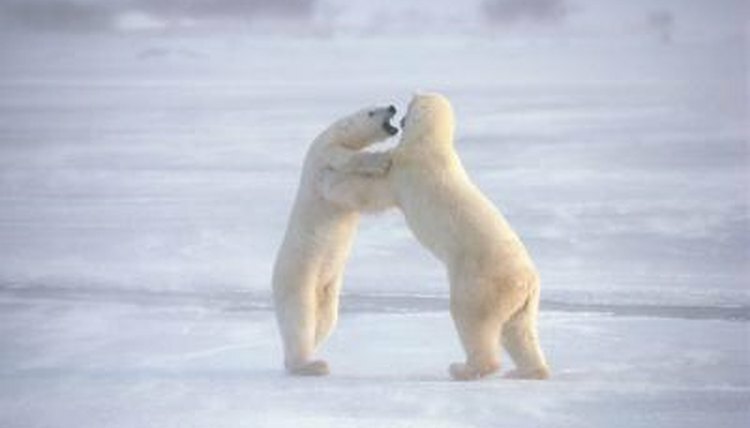 The Antarctic doesn't have any native land mammal predators, but the Arctic polar region sports several species. The largest is the polar bear, whose thick fat layer and water-resistant fur helps them survive the cold weather and swim in the icy waters up to 6 mph. Eating blubbery seals helps them maintain their essential fatty layer. Polar bears are an endangered species, mostly due to a loss of habitat as climate changes cause the ice to melt. They share the region with Arctic wolves and foxes, who hunt mostly cold-weather rodents, although they sometimes catch fish and birds for food. Small herbivorous mammals are essential to the Arctic ecosystem, keeping the predatory species alive. Antarctica is rocky, without enough soil to produce grasses and other vegetation, so these mammals are strictly northern creatures. Lemmings and Arctic hares are common polar mammals and are diet staples of the wolves and foxes. During the warmer months, grazing animals such as musk ox and caribou migrate farther into the Arctic Circle for the summer grasses. Wolves sometimes take advantage and hunt the larger animals when they're available. Both polar regions feature a variety of marine life that has evolved to survive in the chilly water. This includes a variety of plankton, mollusk, crustacean and fish species, such as Pacific salmon and sharks. Larger animals make these cold waters home as well, such as a variety of seal and whale species, sea lions, walruses and narwhals. What Animals Can You Find in the Tundra? What Are Some Endangered Species in the Alpine Tundra?